The Big Sea: Peace is the Word of the Day! 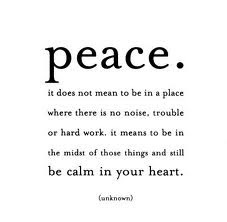 Peace is the Word of the Day! My summer break started, and I instantly went into that "peace that passes all understanding" frame of mind which means that I am feeling relaxed and clear, and it would take a whole bunch to get me upset right now. Peace is the word of the day!! According to the Bible, we must "Pursue Peace!" Amen! I fell into the trap of responding to a really offensive post about race. They won't get me again. Peace be still. Toya, I was almost baited into the craziness, but I resisted it; Pursuing Peace over here :) Thanks for stopping by, because I know that you are BUSY! Disappointment is Part of Life!